St. Joe Land Company, is located near Albany, Georgia in the heart of the plantation area. Location: The property owned by the St. Joe Land Company, is located near Albany, Georgia in the heart of the plantation area. Neighboring plantations include Nilo, Tarva, Gillionville, Wynfield, Abigail, Pinebloom, Magnolia, Cane Mill, Pineland, Blue Springs, Pine Knoll, Ichauway and Wildfair. The plantation has frontage on the Tarva road and Leary Road (Hwy 62) about seven miles west of the Albany Regional Airport. History: Creek Indians and other tribes inhabited the area until settled by the white man. Pottery, spear points and other artifacts are commonly found around the property. Prior to the late 1800's the property was held by various owners for farming purposes. Cotton was king in Albany, being shipped down the Flint River by ferry and later transported by train. Around 1905 the Red Cypress Lumber Company and other entities controlled by Gordon Reynolds acquired the property for timber production. The advent of the railroad brought wealthy northern industrialists to the South Georgia area. They were enticed by the scenery, agreeable climate and the abundance of wildlife; particularly Bob White Quail. During the first half of the twentieth century about 35 hunting plantations were established around Albany. This property is located in the center of these well-known plantations. 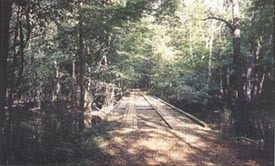 The St. Joe Land Company acquired the plantation for it's wood producing potential in 1958. Current Use: Timber production provides the primary source of income for the property. As they mature in future years, young stands of planted pines will help to insure that this income stream is continued. The plantation is also used for hunting and other recreational activities. In recent years the property has been selectively thinned and managed to improve the wildlife habitat. Certain parts of the plantation have been leased to various hunting groups such as Gillionville Plantation, a neighbor that operates an exclusive quail-hunting club. Another portion of the property was leased to the state of Georgia for deer hunting. Other parts of the plantation have been used to entertain clients and friends of St. Joe's executives. Timber Information and Price: The property contains a significant amount of merchantable and pre-merchantable timber. Detailed information regarding the amount of timber of individual tracts and the asking prices can be obtained from Plantation Services, Inc. The Offering: The property is being offered in six (6) separate parcels. Purchasers are encouraged to submit proposals on any or all the tracts using a Letter of Intent, as it is the seller's intention to use the St. Joe Land Company formal contract agreement. Description: The property is one contiguous tract consisting of a mixture of uplands planted in pine timber, small fields, hardwood lowlands, creeks and several lakes and ponds. The timber has been professionally managed for almost 100 years. The land is level or gently rolling and contains an excellent internal road system. There are no "public" roads of any kind within the property, with the exception of the Triangle Tract (740 acres) located on the east side of Tarva Road. The woodlands on the plantation are among the most beautiful in the southeast. Sportsman and wildlife enthusiasts will find a diversity of interests. The land is a breeding ground for all kinds of game and wildlife. The property has been known for years as having on eof the largest deer and wild turkey populations in the United States. Recognizing the unique characteristics of this land, the Nature Conservancy has recently purchased from the St. Joe Land Company approximately 15,000 acres along the western boundary of the subject property for 30 million. The remaining 14,597 acres is one of the largest timber tracts in the southeastern United States suitable for development as world class hunting property.